It has been the tradition for the bride and groom to give their wedding guests a little something to take home from their wedding. To get you started in choosing your own unique wedding souvenirs, here are some wedding souvenir ideas from Kasal.com! Photo Booth. A photograph from the photo booth is probably one of the most common wedding souvenir items in the country. Why? Because it’s both entertaining and meaningful to your guests! It’s an additional activity for your wedding day as your guests can each have their photo taken (with props and friends, of course). The photo will be a meaningful souvenir item for them as they get to keep their wacky smiling faces on your wedding day. Bride and Groom Items. There are a lot of matching bride and groom souvenir items like salt and pepper shakers, small tin or paper containers, key chains and the lot. The small containers may be filled with your choice of either mints, candies or chocolates! We’re sure your guests will find these very adorable! Wines. 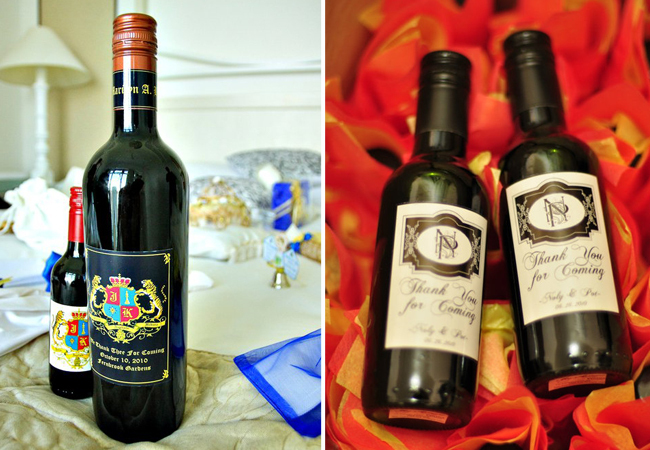 Wines are great wedding favors especially for the adults. It is a classy and elegant gift that can be easily stored at home or be shared with friends/family. For soon-to-wed couples, wine is easy to buy and easy to customize with stickers. Wines can either be in full bottle size or in cute mini bottle sizes that you can customize with your wedding logo and/or a simple thank you message to your guests. Chocolates. Everybody loves beautifully wrapped chocolate. And thankfully for us in Manila, there are chocolate favor suppliers that package our well-loved chocolate into beautiful wedding souvenirs. These can be in boxes, individually wrapped or in cute paper containers. Cupcakes and Pastries. Aside from chocolates, cupcakes and pastries can also be great yummy wedding favors to bring home. These can be as simple as a jar of cookies to cupcakes and mini-cakes with elaborate designs and flavors. Sweet-toothed guests will surely love this treat! Butterflies. Who doesn’t love butterflies? 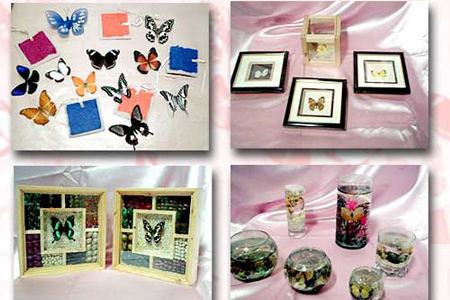 Aside from the live butterfly release on your wedding day, you can also give away butterfly souvenir items. This is a perfect match for summer garden weddings. The possibilities are endless! You can customize any wedding favor to match your wedding theme, color motif and your budget with some creativity and an open mind. Cupcakes can be fun and floral for garden weddings, or more elegant for hotel weddings. Chocolates can be shaped into beach items for beach weddings or be individually wrapped with romantic movie lines. Religious items can be individually blessed for good luck to all your guests. There are a lot of options for your wedding souvenirs. Just be creative, smart and find wedding suppliers you can trust. For Manila Wedding Souvenirs, visit the Kasal.com Supplier Directory now!